High top coated textile and stretch mesh sneakers in black dye white. Overdyed detailing throughout. Embossed logo at round toe. Zip closure and concealed bungee style lace up detailing at vamp. Bonded logo at padded grey tongue. Grosgrain pull loops at heel collar. Printed logo in grey and transparent trim at outer side. Perforated rubberized trim at inner side. Rubberized trims in white and grey at heel counter. Rubber midsole in tones of brown, black, and grey. Treaded rubber outsole in tones of white, grey, and brown. Tonal and brown hardware. Tonal stitching. 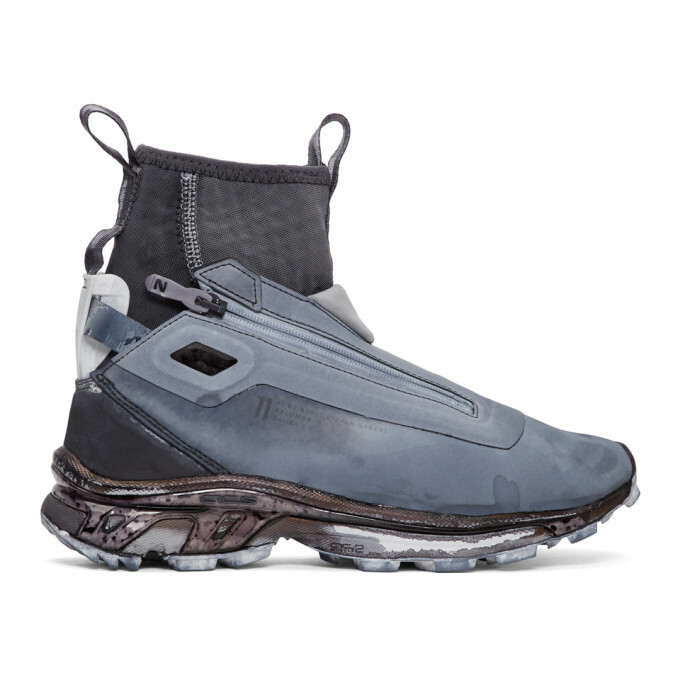 Part of the 11 by Boris Bidjan Saberi x Salomon collaboration.